The Peanut Butter Cup and Sea Salt Caramel yogurt pops are standouts, given the rarity of such flavors in frozen treats. They are beautifully executed. Nor could we tear ourselves away from the Dark Chocolate Raspberry and Mint Chocolate Chip. 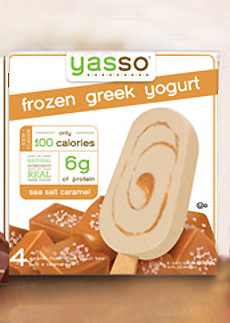 Amazingly, the product developers at Yasso managed to pick our favorite flavors! The original flavors—Blueberry, Coconut, Mango, Strawberry, Vanilla Bean—weighed in at 70 or 80 calories. With the new flavors the count has been upped a bit, but so has the flavor. You can’t find a better 100-calorie treat or everyday snack (add an extra 10 calories for the chocolate-dipped and 30 calories for the peanut butter). Made of Greek yogurt and other natural ingredients, the pops are available at retailers nationwide. The line is certified kosher by OU.